Daleys Fruit Tree has Plants for Sale to Main Beach and can Mail Order them to you door. Click to Find out how much Freight Will Cost. Young dragon Trees have a single stem. 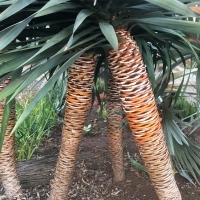 At about 10 - 15 years of age the stem stops growing and produces a first flower spike with white, lily-like perfumed flowers, followed by coral berries. Soon a crown of terminal buds appears and the plant starts branching. 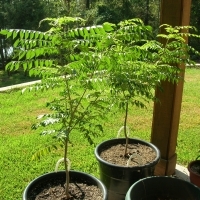 Each branch grows for about 10 -15 years and re-branches, so a mature plant has an umbrella-like habit. Very slow growing requiring about ten years to reach 1.2 meters. 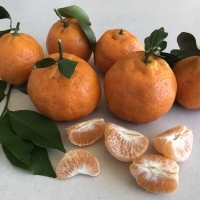 This popular variety of 'lemon' is not a true lemon but likely to be a natural hybrid between a lemon and an orange. 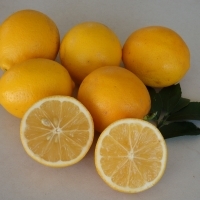 The lower acidity and reduced bitterness makes it one of the most widely grown lemons for the home-garden. Very hardy and prolific. The dwarf rootstock, flying dragon modifies the top growth making this a dwarf plant that is ideal to use planted out or as a pot specimen.